The only way to open this editorial is to admit something I've been rather shy about on the pages of Engadget: I've been an avid BlackBerry fan and user for about six years now. I mean a real addict -- the kind who wakes up each morning looking for a blinking red LED, the kind who's refused to give up push email and BlackBerry Messenger in favor of more powerful, polished, and progressive mobile operating systems like iOS, Android, and webOS. In fact, when my Verizon contract was up last year I opted to get a Curve 8530 instead of the Motorola Droid or Palm Pre -- to say nothing of making the leap over to AT&T for the iPhone. There were lots of reasons I didn't want to give up my BlackBerry, but five days ago I lost that very Curve in a San Francisco cab. Then coincidentally, a day later I saw RIM co-CEO Mike Lazaridis speak at the D: Dive Into Mobile conference, where he almost embarrassingly avoided every question about the company's immediate smartphone strategy. I had always known that RIM was behind the curve (always a great pun! ), but I also always had hope that the company would catch up with modern smartphones of today. Sadly, watching Mike dodge questions on the D stage took that hope away from me -- it's crystal clear that RIM won't have a solution to compete with those powerful smartphones anytime soon. So, what happens to a BlackBerry diehard like myself? Where do I go from here? Before I get to the rather tragic events of the last week, it's only right to explain why I clung to a BlackBerry -- or "that dinosaur" as a certain clever, bagel-eating analyst repeatedly referred to it -- for so long. Yes, I endured countless inquisitions on why I refused to give up my Curve over the last couple of years, but I defended my attachment to the mobile platform with what became a prepared list of reasons. First, there was the form factor -- I absolutely love a good physical keyboard and I just couldn't imagine giving up the portrait keyboard for a soft keyboard. (I was able to type close to 50 words per minute on my old Curve 8330, after all.) And while I could get a physical keyboard on Android or webOS devices, I couldn't also get the messaging components of the BlackBerry OS -- and by that, I really mean BlackBerry Messenger. I'm more than aware that many don't understand the appeal of BBM (notably nearly all of my fellow Engadget editors! ), but most of my closest friends and family have BlackBerrys, and the native messaging client absolutely destroys text messaging in terms of speed and capabilities. (I could spend a good 500 words on why BBM is so great, but that's really an entire editorial and RIM ad campaign unto itself.) There's also BlackBerry's unmatched push email speed -- many times I've reached for my BlackBerry to read a message long before it hit my laptop screen. Of course, there were other reasons to love my BlackBerry as well: good call quality, reliable networks, and yes, BrickBreaker. But BBM and the keyboard remained at the top of my list. I figured that in a year or so, I'd buy a new BlackBerry -- one that would have all the features I love but also be faster, better at surfing the web, include real touch support, and have a broader selection of apps. But, obviously, I had to make a lot of sacrifices for those features, including speed, app selection, and ease of use. How many times did a friend with an iPhone or an EVO look up a bar or restaurant using Google Maps at least a minute faster than me? At least 100. How long would I wait for my phone to reboot after installing an app? A solid four to five minutes without fail. How many times did I open my laptop and jump on 3G to look at a website, just to avoid having to wait until it would load on my phone? Believe me, more than I care to admit. Yes, I made lots of sacrifices for BBM and that keyboard, mostly because I believed RIM would eventually improve the OS and the hardware that powered it. I figured that in a year or so, I'd buy a new BlackBerry -- one that would have all the features I love but also be faster, better at surfing the web, include real touch support, and have a broader selection of apps. Instead, RIM's given me the BlackBerry Torch as the answer to the iPhone and Android. I use the word "answer" lightly -- even a hard-core fan knows that the Torch isn't competitive, at least not in comparison to the other smartphones on the market. The Torch does provide a slightly better browsing experience, and BlackBerry 6 has been polished a bit, but still the general experience is sluggish and the applications are nowhere near as robust as the ones for iOS or Android. And when you look at it from a purely hardware perspective, the Torch offers a smaller screen, lower resolution, and slower processor than much more powerful phones on the market, yet costs nearly as much. A major industry question suddenly became very personal: a year and a half after buying the 8530, was there really no solid smartphone option in the market from RIM? Which brings me up to today. With my Curve lost somewhere between my hotel and San Francisco airport, a major industry question suddenly became very personal: a year and a half after buying the 8530, was there really no solid smartphone option in the market from RIM? Obviously, I knew the answers to that question -- I'm a tech editor after all -- but it wasn't until I saw Lazaridis speak a day later that I saw the writing on the wall for me and the company: RIM doesn't have a competitive smartphone now, nor will it have one any time in the near future. The mobile shackles I'd chosen to live in weren't going to be clipped off anytime soon -- in fact, it looked like the pain was only to get worse. This must have been quite a performance by Lazaridis, right? It was, and I highly suggest you read the liveblog or watch the full interview. RIM's co-CEO muddled through explaining the company's mobile strategy, and while he stressed that it continues to see global growth, especially in 2G markets, he focused primarily on the upcoming PlayBook tablet. It was almost comical to watch Lazaridis respond to questions about the company's handset business with information about the upcoming tablet and skirt questions about its US smartphone business. Now, don't get me wrong, from what I've seen of the PlayBook, it looks absolutely awesome -- the QNX OS looks incredibly snappy and the interface is well laid out and extremely eye-catching -- but that's a tablet. What about the tablet that I want to put in my pocket, as one smart journalist asked Lazaridis at the conference? When will I get the power and apparent robustness of the PlayBook in a smartphone? Not for a while, Lazaridis let on. And that's where RIM seems to be totally adrift at the moment -- it's working on a powerful operating system for its seven-inch tablet without offering any hope that that work will pay off on its smartphones. It's confusing -- RIM seems to be creating its own mobile class system of smartphone serfs and tablet nobles, if you will. Phones with an outdated OS have been given slight sprinkles of modern day functionality while the PlayBook receives fresh, multicore software with an innovative UI and apparently great performance. And while the plan is (apparently) to put QNX on higher end handsets once dual-core processors are ready, Lazaridis spent much of the interview defending BlackBerry 6 and avoiding offering any real timeframe on when we'd see QNX on phones -- even though dual-core chips like the Tegra 2 are already appearing on phones like the LG Star. It was all a bit hard to decipher, but the strategy seems to be: keep the current smartphone platform in the market at the moment, build out QNX on the PlayBook for a Q1 2011 release, work to bring the OS down to dual-core smartphones once the power consumption is right, and then finally enter the high-end smartphone game for real -- a timeframe that seems to stretch out at least a year if not more. That strategy might makes sense on a few levels, but Apple, Google, Microsoft and Palm aren't going to sit still while RIM gets to work, and I need a phone now. Nope, it all doesn't leave a BBM-loving, BlackBerry diehard in search of more than just great messaging and a physical keyboard in a good place. And I think you can see why watching Lazaridis speak was the breaking point for someone like myself, who had been waiting for at least a year and a half for RIM to put out a phone we can call great by today's standards. Indeed, I'm excited about QNX on phones and everything else that's promised in the next few years (heck, add Windows 8 and Light Peak to the list! 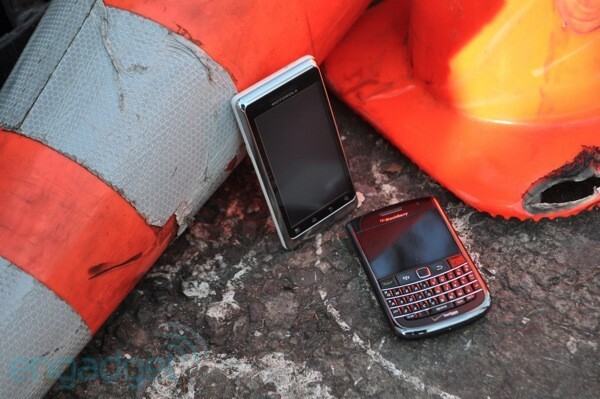 ), but I'm left with zero options from RIM today, tomorrow, or even in the next few months. So, I had to do what lots of people out there have already done, the unimaginable for a true BlackBerry fan: I walked into a Verizon store, forgot about that BlackBerry defense list, and signed a two-year contract on a Droid 2 Global. I'd like to think that by the time my contract is up I'll be able to buy a BlackBerry with more than just great email and messaging, but until then I'm trading in BBM for SMS, Kik, and GChat.